everyone slowly make their way along the railroad tracks toward Terminus it seemed pretty clear it wouldn’t be everything they wanted it to be. That being said – it’s even worse. It’s worse than Woodbury and the Governor, worse than the murderous little Lizzie, worse than the people Rick was hiding from in the house (more on them later though! ), and worse than the walkers themselves. We don’t even really know how bad it is, or what’s even going on there, but we know it’s bad. Very bad. The season four finale is the best season ender yet and despite the ups and down it reminds me why I love The Walking Dead. Throughout this episode, as Rick (Andrew Lincoln), Carl (Chandler Riggs) and Michonne (Danai Gurira) make their way toward Terminus, we’re treated to flashbacks of when life was, comparatively, not all that bad at the prison. Hershel (Scott Wilson) tells Rick that they can make a life for themselves there, raising kids and growing their own food. All along we know none of it works out. The pigs they are raising are sacrificed to the walkers, Hershel is killed, and the prison is destroyed. Nothing works out for them – ever. The episode where Carol (Melissa McBride) is forced to kill Lizzie (Brighton Sharbino) is just another reminder that sanctuary is not possible. Weren’t Daryl (Norman Reedus) and Beth (Emily Kinney) discussing settling down in the funeral home before all hell broke loose? 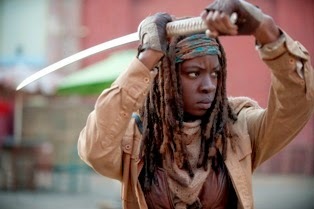 Didn’t Rick, Carl and Michonne find a nice neighborhood for a while? It doesn’t work. Yet, they are on their way to Terminus in hopes of finding a safe place. You would think they would know better, but hope always wins out over logic. Last week we saw Maggie (Lauren Cohan) reunited with Glenn (Steven Yeun) so maybe that gave them the thought that good things still do happen in their world. Their group found the gate to Terminus, dropped their weapons and just walked right in. It seemed like a strange thing to do under the circumstances, but maybe they were just all worn out and ready to stop fighting. Just the hint of sanctuary was enough to make them let their guard down. On the other hand, Rick, Carl, Michonne, and Daryl were not so ready to walk in the front door with their arms wide open. Not that it mattered much. They all ended up in the same place – locked in a train car waiting for God-knows-what to happen to them. 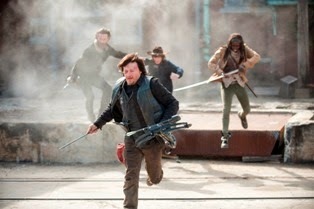 Prior to that, we were treated to an intense reunion between Daryl and Rick’s group. I thought we might lose a few characters there, but somehow they all managed to survive the sadistic group Daryl had hooked up with – the same group Rick was hiding from in the house. It was a cool scene with a lot of action, but it didn’t have a lot to do with the story…or did it? Maybe it didn’t further the immediate plot, but it told us a lot about what Rick is capable of – specifically, severing someone’s jugular with his teeth. 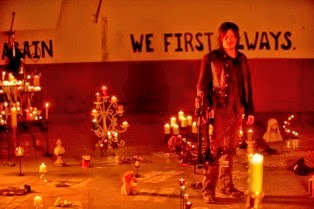 We know that Daryl is still loyal to Rick and the group. So we know they have some fight left in them after all. And if they are going to get out of Terminus they are going to need it. Terminus – what exactly is going on there? It set a new tone for the show – a somewhat sci-fi –esque vibe that I really liked. I’m hoping to see more of the people – particularly Mary (Denise Crosby) who seems to be some kind of homicidal cult leader. Currently we know Rick, Carl, Michonne, Daryl, Maggie, Glenn, Sasha (Sonequa Martin-Green), Bob (Lawrence Gilliard Jr.), Tara (Alanna Masterson), Rosita (Christian Serratos), Eugene (Josh McDermitt) and Abraham (Michael Cudlitz) are prisoners in Terminus. We didn’t see Carol, Tyreese (Chad L. Coleman), Beth, or Judith, so they could be anywhere. Are they prisoners too? Are they still on their way? Who took Beth? Now we have to wait until October to find out what happened to everyone and more importantly what Terminus is exactly. Don’t forget that Eugene has the secret to this whole thing (or at least he says he does). There are so many great possibilities for this show. I’ve sometimes wondered just how far they can take a zombie show, but as soon as I start to think they are running out of steam and settling into formula – they surprise us with something new.